I am so happy to see this 2008 British bio-pic get a DVD release in the United States. It will hit the racks via The Inception Media Group on March 20, 2012. I’ve been a fan of instrumental pop since I was a kid with a transistor radio strapped to the handlebars of my first two wheeler bicycle. Percy Faith’s “Theme From A Summer Place”, “Green Onions” by Booker T. and The MG’s, Santo and Johnny’s “Sleepwalk”, the Tijuana Brass tunes and even the Bert Kaempfurt hits were all just fine with me. Then in late 1962 “Telstar” arrived on the airwaves like its namesake – an outre sounding slice of the future. Its buzzy pre-Moog melody rendered by quirky Clavioline keyboard was irresistible, as was its rolling “Peggy Sue” style drumming. I have collected many cover versions of the song over the years, but nothing comes close to the original’s unique sonics and dynamism. The auteur of this mini-masterpiece was Joe Meek. 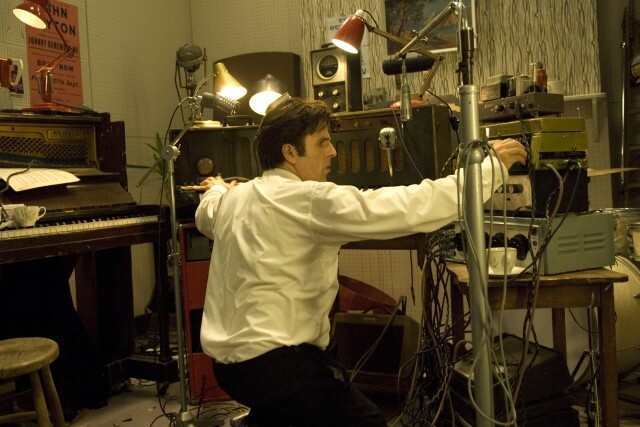 Far from the rarified and clinical confines of EMI’s Abbey Road complex, Meek produced his unique sonic creations in an jerry-rigged 3 floor apartment above a leather goods shop. This did not deter him from blessing us with such gems as “Telstar”, The Honeycombs’ “Have I The Right” and recording hundreds of other sides. His production of John Leyton’s #1 hit “Johnny Remember Me”, with reverbed soundscape and haunting female vocal, could be heard as a progenitor of Ennio Morricone’s spaghetti western soundtracks. His home brewed electronic audio inventions spearheaded the evolution of sound recording in the 1960’s. Yet he did not live to hear Sgt. Pepper. 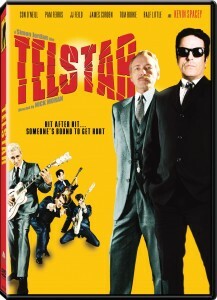 Telstar, the film, is a beautifully produced and superbly acted recounting of Meek’s meteoric flame out. The great ensemble cast is headed by Con O’Neil as the titular “mad genius”. The Tony Award winner O’Neil previously played the manic record producer on stage in London (2005) to rave reviews. It’s a whisper to a scream performance that conveys every shade of emotion from the joy of acclaim to the depths of amphetamine fueled paranoia. Kevin Spacey plays astute financial backer Major Wilfred Banks, a buttoned down, stiff-upper-lip, remnant of the old empire who believes in Joe’s genius but tries unsuccessfully to keep his ego and spending in check. The screenplay, written by James Hicks and director Nick Moran (Harry Potter’s Scabior), is filled with fast paced, quick witted banter and loaded with historical minutiae. The set direction accurately represents the cramped apartment studio with backup vocalists in the bathroom, the string section on the floor below, and the landlady banging on the ceiling to quiet the racket. Visual clues to other Meek acts (Mike Berry, Cliff Bennett) adorn the walls in the form of vintage posters. A neat background detail is the cover of London Records LP “Sounds of the Tornadoes” album, which “accurately” misspells the bands’ name. Scenes of promotional gimmicks concocted for Screaming Lord Sutch will illicit grins and chuckles for their naive but effective ingenuity. If you are a fan of sixties “Brit-Pop” you’ll be treated to portrayals of some of your faves in their formative years. Richie Blackmore and Mitch Mitchell at one point or another played in bands recorded by Meek. The Tornados, under various names and configurations, backed Gene Vincent, Billy Fury and the aforementioned Lord Sutch. They were essentially the “house band” for Meek’s RGM productions; a bed-sit “Wrecking Crew” of sorts. Tornados drummer Clem Cattini, wonderfully characterized by James Corden, went on to play sessions for innumerable songs you know including The Kinks’ “You Really Got Me”, Johnny Kidd and The Pirates’ “Shakin All Over” and T. Rex’s “Bang A Gong”. He is the monstrous psychedelic pulse of Dovovan’s “Hurdy Gurdy Man” – often miss-credited to John Bonham. The list of 45 Number 1 singles he played on can be found here. Cattini himself makes a cameo appearance in the film, as do Chas Hodges and John Leyton. Meek’s demise came at his own hand on February 3, 1967. Using a shotgun registered to Heinz Burt whose career he nurtured and whose affection he sort, Meek first killed his landlady Mrs. Shenton then pulled the trigger on himself. It was eight years to the day after the plane crash that took the lives of Buddy Holly, Richie Valens and “The Big Bopper”. Meek, a spiritualist and Holly devotee believed he had divined the date of the crash and (according to the film) tried to warn Holly during the guitarists’ British tour. I love this film and would have equally loved to know more about its production. A second audio commentary from the director, writer and cast members or a production bonus feature would have been a nice touch. Missing that, you can snoop around YouTube for the BBC’s Arena documentary on Meek. Its archival footage and interviews with the major players (many now deceased) will clue you in to the amount of attention that was paid to “Telstar’s” historical accuracy. 1960’s fans should own this look at Britain’s pre-Beatles music biz. Use of original recordings in approximately 95% of the film is commendable and appreciated. Gene Vincent’s “Temptation Baby” and credits closer “Crawdaddy Simone” by The Syndicats are particularly fun. Both those familiar with or currently unaware of Meek’s story will be impressed by the performances and the amount of information imparted during the film’s less than 90 minute running time. It is densely packed experience and repeat viewings are rewarding.